Imagine, if you will, David Bowie crossed with the Electric Light Orchestra and Foreigner, performing songs from a deranged prog-rock version of Phantom Of The Opera. 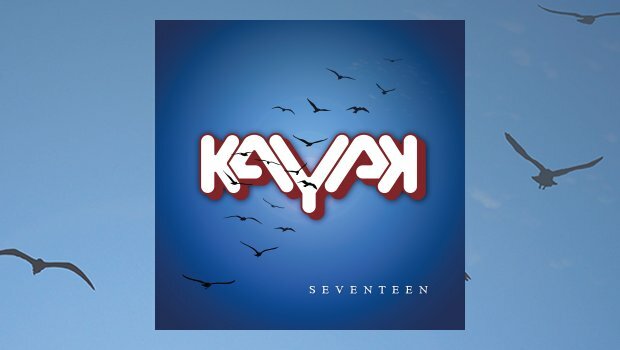 Welcome to the seventeenth and possibly best studio album by Kayak. Entitled, with stunning lack of imagination, Seventeen, it’s a bold, confident, bombastic return to form for the Dutch pop-proggers. And it features Camel’s Andy Latimer on one of the tracks. What more could you want to get the New Year off with a bang? What’s all the more astonishing is that Kayak have had more break-ups than the Antarctic ice shelf – and more comebacks than a homesick boomerang. After some acclaimed early albums in the 1970s, the band became steadily more commercial until folding in the 1980s – proving that success does not lie in alienating your old fans while failing to find any new ones (Caravan take note). Reformed 18 years later, albums have appeared sporadically and there have been a few gems among the dross, most notably a couple of well-meaning rock operas, but I’m sure not even Kayak’s most rabid fans would list Coming Up For Air, Letters From Utopia or Anywhere But Here in their all-time Top 10. Following the sad death of drummer Pim Koopman and the sudden departure of two vocalists it seemed Kayak had been holed below the waterline and were sinking without trace. But wait! What’s this sailing triumphantly over the horizon? It’s a brand new Kayak, paddling full speed ahead for the shores of Prog Island. The band are pretty much down to one man now – keyboardist Ton Scherpenzeel – but that’s not necessarily a bad thing. Sometimes good comes through adversity – think of Paul McCartney and Wings, down to a trio for Band On The Run. Scherpenzeel has recruited a completely new line-up, including Bart Schwertmann on vocals and Marcel Singor on guitar – and the pair make a vital contribution to this latest comeback. The first thing you notice is the three long songs as Scherpenzeel unabashedly nails his prog leanings to Kayak’s mast. La Peregrina, Walk Through Fire and Cracks may not challenge Close To The Edge in scope and complexity but they are well-constructed pieces that rarely drag. La Peregrina, in particular, alternates thunderous choruses and operatic chants with emotional piano flourishes, finishing with an air-punching climax. Walk Through Fire is more contemplative but has enough changes in mood and tempo to keep your attention, while Cracks is dramatic and emotional. Even the short songs pack plenty into their three or four minutes. Opener Somebody is a bold, powerful statement of intent with fascinating key changes and interesting melodies that will immediately put you in mind of Foreigner’s Cold As Ice; Feathers And Tar crashes along like a runaway steam train; All That I Want lacks just dry ice and big hair; God On Our Side is like Queen doing musical theatre. And there’s one of the most beautiful tracks you will probably hear all year – Ripples On The Water, a short but moving instrumental featuring Andy Latimer on guitar. Thanks to Scherpenzeel’s chameleon-like musical abilities it does indeed sound just like Camel. Schwertmann’s vocals are as bombastic and operatic as the songs. Sometimes he’s Bowie, sometimes Roy Wood. He has a powerful voice that delivers the songs with just the right amount of commitment and operatic fervour. Singor’s in-your-face guitar licks are equally strong, offering Queen-like orchestral punch as well as some obligatory screaming lead. Sure, there’s a strong whiff of AOR cheese about it all and you will enjoy spotting the influences – some Foreigner here, a bit of Supertramp there and melodies from the Jeff Lynne school of songwriting. – but the whole thing is done with such enthusiasm, skill and sheer bravado that you just can’t help admiring Seventeen – and falling in love with it. Proof that you can have your Kayak and eat it.